I am a big fan of the White River, mostly because of it's remote nature and beauty. For the best whitewater I recommend high water runs down the upper (Keeps Mills) section, which is essentially a twelve mile long rapid at flows between 1000-1500 cfs; runs down that section at higher flows are great fun and won't soon be forgotten! However, if you want a wonderfully scenic trip with some nice rapids thrown in, the lower White is the best option. I'm sure the upper is scenic too, but usually when I run it my eyes don't really leave the river much, especially when the river is really ripping. (Folks often complain about wood on the upper run, but I've seen a lot worse; I'll be putting out a trip report soon on the upper section.) This report describes the Lower White River from White River Bridge to Tygh Valley. 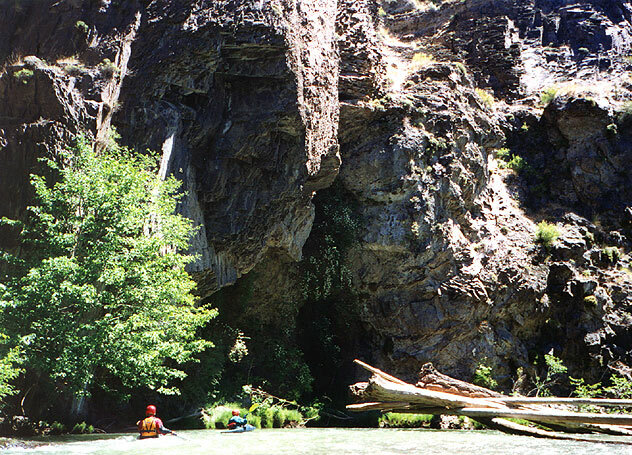 This stretch is also known as the Canyon Run on the White, or sometimes simply as the 'easier' section on the White River. This section is widely acclaimed for its scenic beauty, so if you haven't run it you are missing out. 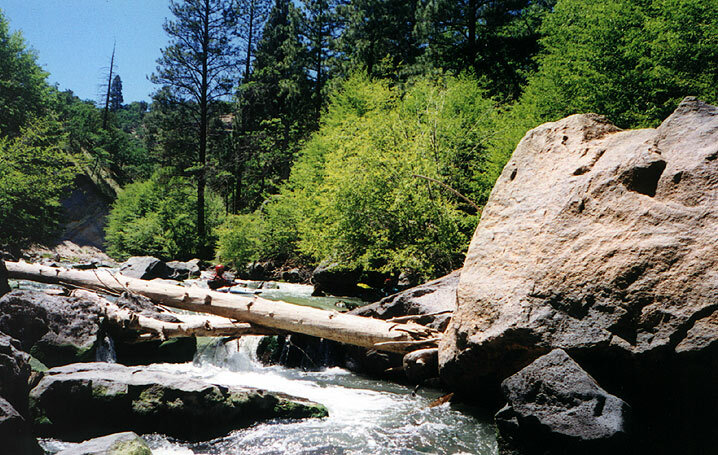 The rapids are never very difficult, which means the river can be paddled by intermediate level boaters with good eddy hopping skills and some prudent scouting. You are a long way from civilization on this section of the White, making it an ideal candidate for those wishing to have a wilderness experience without an overnight stay. The White River gets its name from the glacial silt that clouds the river at it's source. Originating at the head of the glacier on Mt. Hood, this river usually runs late into the summer and is paddled regularly. Because the river is in eastern Oregon, the weather is almost always hot in the spring and summer, so dress accordingly. I ran this section with Mike Haley and Tom Powers, after running the Upper (Keeps Mills) section the day before. We all agreed that the lower was much mellower but also much more scenic than the upper section. Tom Powers plays around as we enter the canyon on the lower. The character of this section is more pool-drop than the upper (Keeps Mills run) section. The pools can be long at times, but the canyon is so striking you won't really care. That said, the boulders forming the rapids on this run are much larger than the upper section, and tend to gather wood as a result. You can run all of the drops by boat scouting, but I don't recommend it unless you have a healthy dose of log repellent on your boat that day. 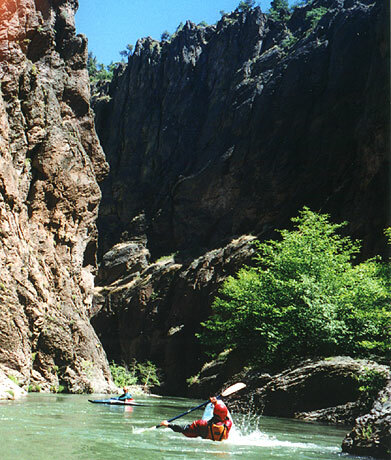 Besides, the scenic beauty of this canyon is the primary reason to paddle this stretch, so why hurry? Mike and Tom somewhere on the Lower White. Now a photo of one of the loggy rapids. As you can see, a little prudent eddy hopping is all that is required to safely navigate this drop. However, be careful in there. If you have read Steve Stuckmeyer's essay 'Aqualung' on this site you know that the penalty for complacency on this run can be very high. Like I said, I did this trip with Mike and Tom, and a funny thing happened as the day wound down. We were drifting along, shooting the breeze, you know. The river was mellow here but fast, and we were all looking forward to dinner at the campsite. Mike was floating sideways downstream near the bank, looking back up at Tom and I and talking. I looked away for a second and I heard a loud 'thud' and when I looked back Mike's boat was upside down! Tom and I started laughing as we saw what had happened; Mike hadn't been keeping an eye out and had gotten smacked (hard!) in the back of the head by a large stick prodtruding from the bank, just at head level for him. To this day we tease him about this, so the next time you see him on the river be sure to join in the fun..